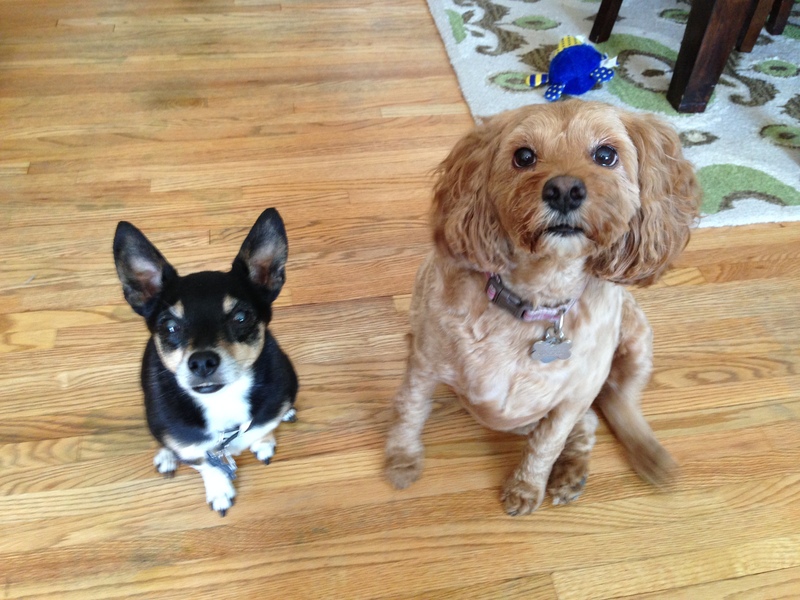 Sadie (pictured here on the right with her room mate Brownie) is a seven-year-old Coker-poo who has separation anxiety, pulls on leash and gets over excited when guests arrive. After observing the dog and discussing the situation with her guardians, I knew I needed to add some discipline to help the dogs learn to better control themselves and structure to help them see their guardians as authority figures. I started out with a leadership exercise that helps a dog practice stopping itself despite a high value item being readily available. I walked through it a few times to be sure Sadie understood the basics then coached her guardians until they had the same success. To stop the dogs from going crazy when people knocked or rang the door bell, I showed the guardians how to claim the space around the front door. When a dog gets in front of a human, it literally sees itself as being the leader. Because these dogs got so excited (Bear even a little bit aggressive), having the guardians take over the job of security will help the dogs learn to assume more of a follower position and not react so excitedly to new arrivals. I had one of the guardians step outside and play the part of the guest so I could show the other how to claim the door way. At first the dogs were determined to stay in front of me, but a few well timed corrections did the trick. I swapped the guardians and repeated the exercise so both had seen the technique, then we tried again. This time I had the guardian answer the door herself and she had a few initial challenges while trying to move the dogs away. The first time is difficult for anyone, and when you have two small dogs, it can be even more challenging. One of the important aspects of moving forward to take territory from the dogs involves moving in a way that causes the dog to almost flinch or want to move back. Because these dogs are both small and low to the ground they were able to move around their guardian. He timing was a bit slow, but I knew that would improve with a few successful repetitions. To better equip the guardian to defeat the dog’s athletic advantage, I gave her a tennis racquet to use on the second attempt. This little tool made a big impact and as you can see, a better result. Looking for other ways to get the dogs to assume more of a follower position, I had their guardian show me what happened when they tried to put the dogs on a leash. While it was far from the most out of control dogs I have worked with, Sadie was excited. Normally I have a client stop and return to their seat as soon as the dog starts to show its excited. As I start to say in the above video its often a sound; the jingle of the leash, the click of the collar, etc that triggers the excitement in the dog as it correlates the sound to the walk itself. Earlier in the session I showed their guardian a technique to stop Sadie from jumping up on people and when the dog decides to do that to her guardian, she used the technique to tell the dog there was a new consequence to jumping up. We ran through the exercise again and while the dog was calmer, it was awesome to see the dog remember the previous correction and stop herself from jumping up. While stopping Sadie from jumping up was big, I had her guardian run through the exercise one last time. As you can see int he video below, the dog is much calmer and even sat down politely in front of her guardian to wait to be leashed up. Time elapsed to get the dog to remain calm when leashed up, about five minutes. I had fitter her up with a Martingale collar and added my special twist to the leash to stop the pulling, but because we took our time in the house, Sadie was completely calm and easy to control on the walk. Instead of running all over and sniffing everything in sight, she fell into an easy heel next to her guardian. Sadie and Brownie aren’t bad dogs, they just misinterpreted what their guardians wanted out of them. Now that their guardians are communicating with them in a way they understand, they can help the dogs learn to move into a follower position. Once the dogs self identify in that position, most of the unwanted behavior issues they have will stop on their own.